The New Worker is now having it’s two-week Christmas break. The next issue will be out on Friday 13th January 2017. THE WORKING class is fighting back; at last thousands of workers throughout the country have been taking strike action — or are planning it — against shrinking wage packets, job cuts, safety cuts and generally awful conditions. 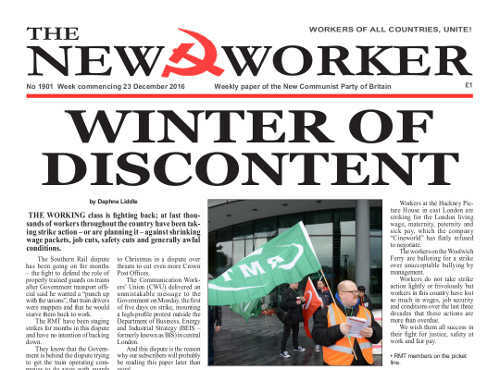 The despatch of the New Worker will be delayed due to industrial action by postal workers during the week before the Christmas break. Our post will consequently go out on the first working day after Boxing Day. MILLIONS of communists in Korea and all over the world recalled the outstanding achievements of dear leader Kim Jong Il at events to mark the 5th anniversary of his passing on 17th December 2011 last weekend. London Korean solidarity activists, including NCP leader Andy Brooks, presented floral tributes during a ceremony at the DPR Korea embassy in London on Saturday 17th December hosted by the new ambassador Comrade Choe Il.